Pressure differentials in enclosures with a high degree of protection with respect to humidity and dust are a result of inside and outside temperature fluctuations. In case of negative pressure or vacuum, dust and humidity can be absorbed through the door seal and can enter the enclosure. As the humidity cannot exit the enclosure condensation may occur. The easy to install pressure compensation device DA284 provides the compensation of pressure at a protection degree of NEMA 4X (IP66). A semipermeable membrane inside the plug allows air and humidity to leave the enclosure. In the opposite direction, it only allows dry air into the enclosure while humidity and dust from the outside are blocked by the membrane. 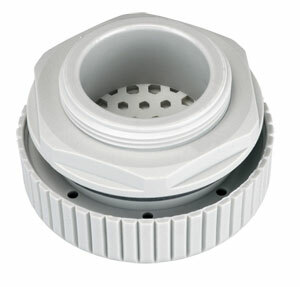 Installation: Make cut-out Ø 40.5 + 0.5 mm (1.6 + 0.02") in enclosure wall and mount pressure compensation device with nut. Please make sure that the sealing gasket is put in place on the outer side panel of the enclosure. For optimal pressure compensation we recommend to use two devices on opposite sides towards the top of the enclosure.